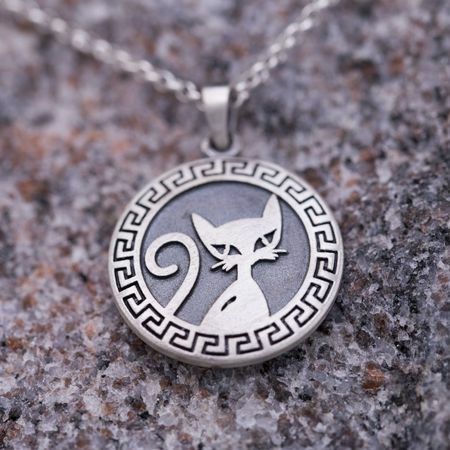 Design your pendant with our talented artists. 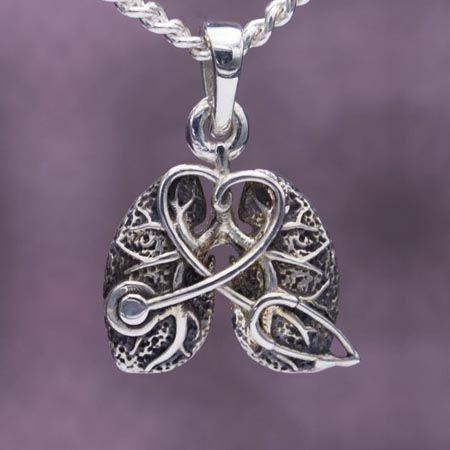 Put something beautiful around the neck of a loved one. 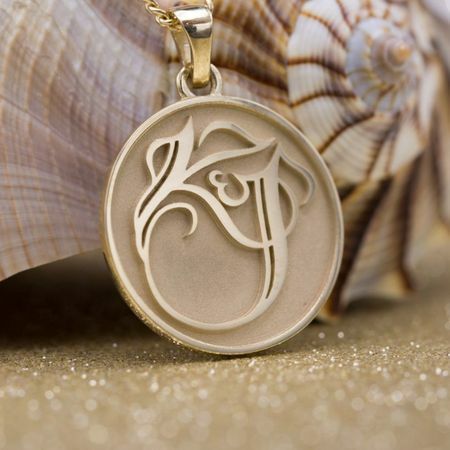 Design your own pendant with our skilled artists to show your unique style or tell a personal story. 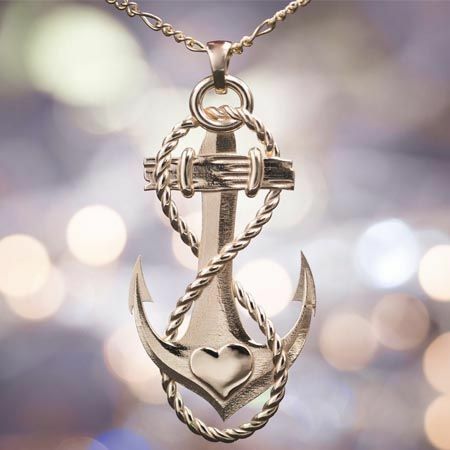 Whether you know exactly what you're looking for or just want to create a beautiful piece of jewelry, we'll design and create the perfect pendant for you. 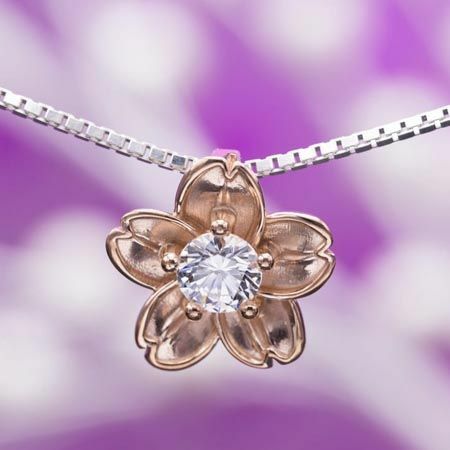 Our team of jewelry design consultants helps you figure out the details, explains your options, and guides you through each step of designing a customized pendant. Our artists create design sketches and detailed 3D renderings just for you, and we'll tweak the details until you say it looks exactly right. 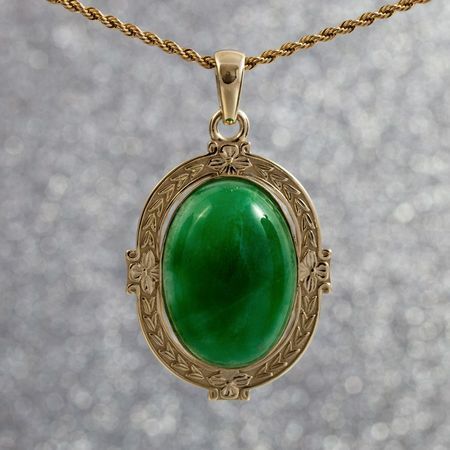 Every team member who works on your design -- designers, artists, bench jewelers, gemologists -- will handle your jewelry project with the utmost skill, care, and expertise. 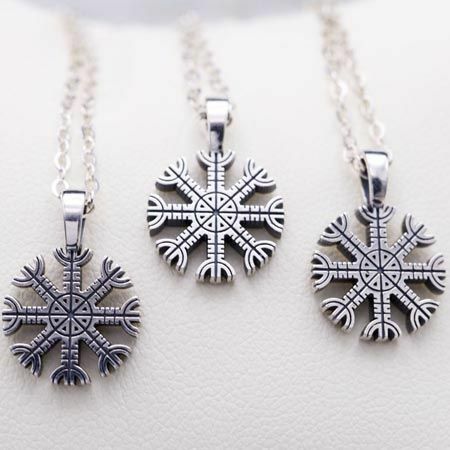 Browse through a few of our recently finished pendants. 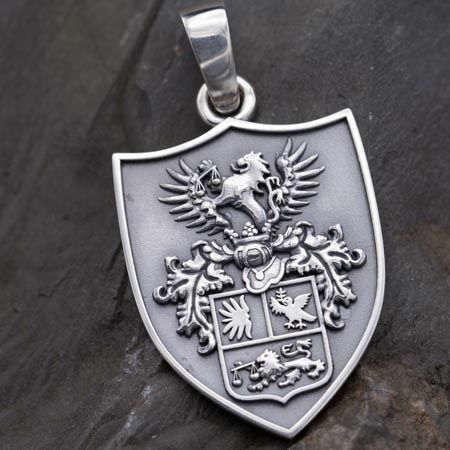 Family crests, birthstone pendants, abstract pieces -- we take our design inspiration from you and turn it into something amazing! 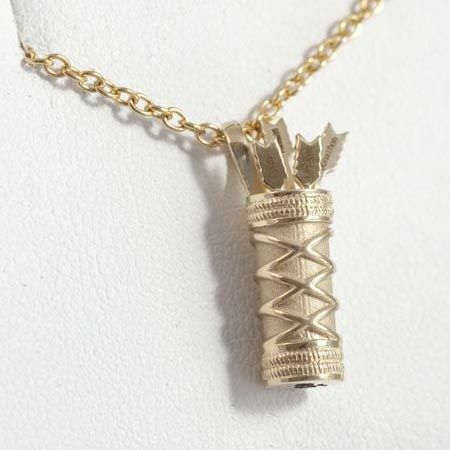 Samuel's Pendant His wife lost a favorite necklace, and we helped him create a new one to replace it. 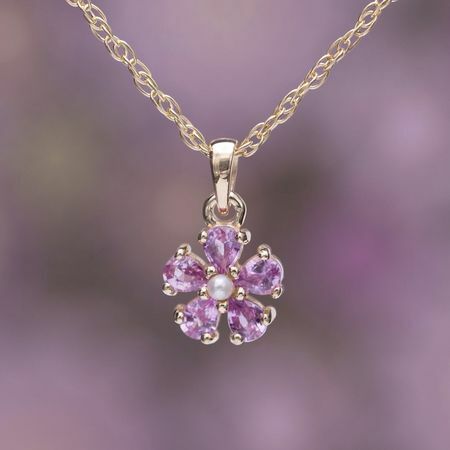 With its beautiful pairing of pear cut pink sapphires and a heart of pearl... we can see why she missed this beautiful little pendant! Brittany's Pendant This piece was inspired by a band's album cover, which was in turn inspired by a symbol known as "The Flower of Life". 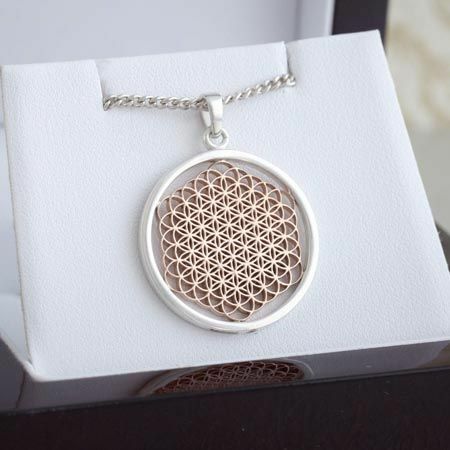 The mixed rose and white gold pendant creates beautiful contrast between the nest of circles and the frame. 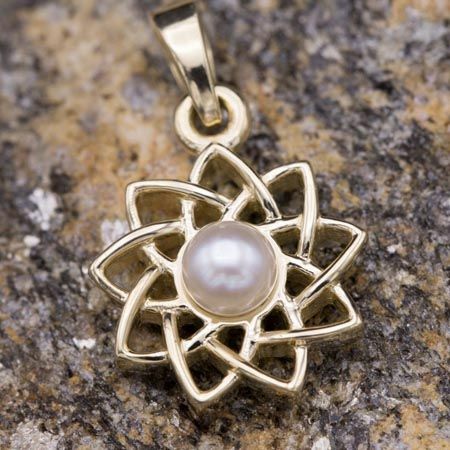 Jonathon's Pendant This gold pendant was the perfect mother's day gift for a mom of four. 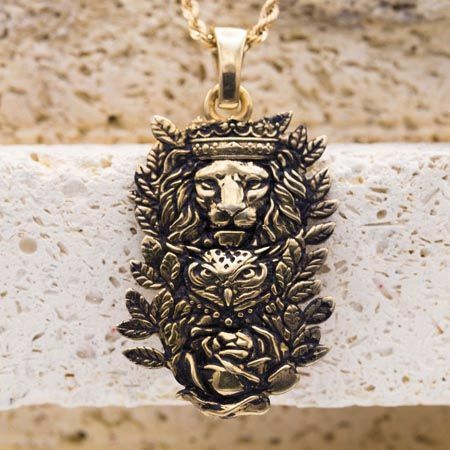 We designed this pendant with one of her sons. A quiver of arrows -- one for each child. 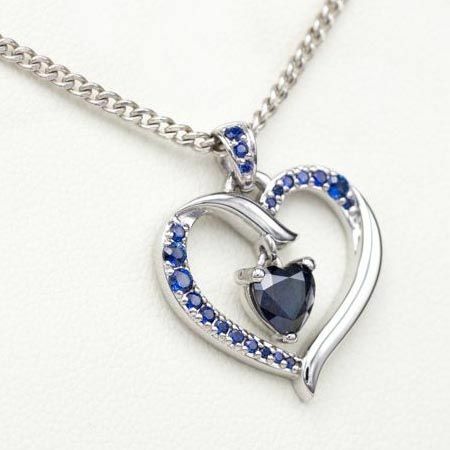 Justin's Pendant Designed as bridal jewelry to match her engagement ring, this heart-shaped 14K gold pendant is traced in blue sapphires and features a deep blue heart-cut sapphire in the center. Something blue for her wedding day! 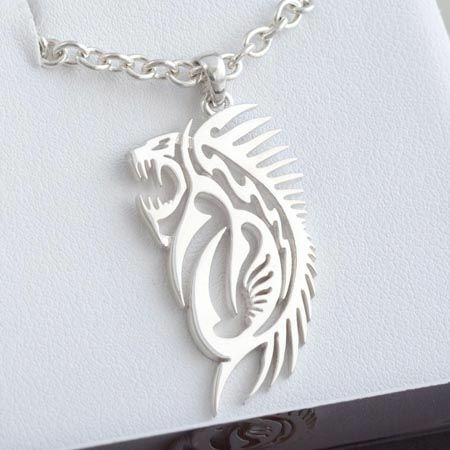 Natalie's Pendant As a going away gift for a friend stationed overseas, this sterling silver barracuda pendant design was inspired by tribal tattoo art. 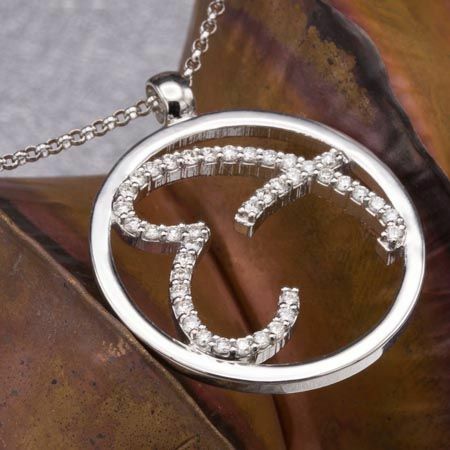 Jim's Pendant We worked with Jim to spotlight the elegant couple's monogram design from their wedding on this sleek gold pendant. 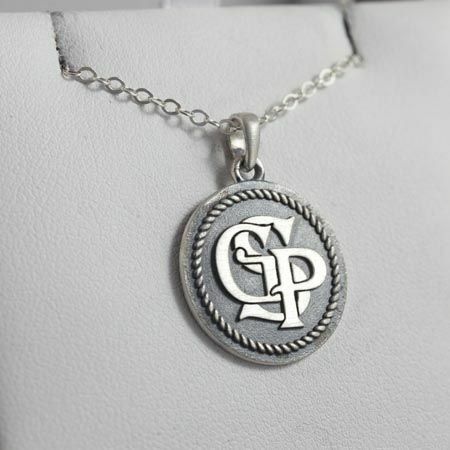 Gerwyn's Pendant The rope border of this monogram pendant is a modern, personal twist on the tradition of laurel wreath detailing. We completed the look with an oxidized, antiqued finish. 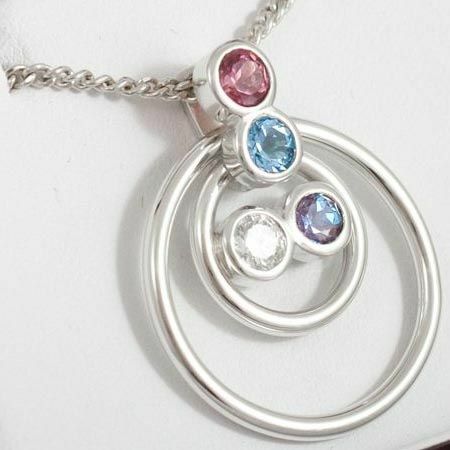 Angie's Pendant This customer had four pieces of gemstone jewelry - each gem a family member's birthstone - that she wanted to re-use in a single birthstone pendant. 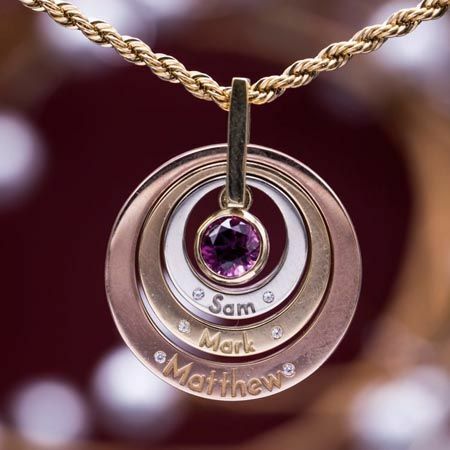 Taking inspiration from the growth rings of a tree, we designed this pendant with rings to represent each generation of her family, and leaving room to add more later. 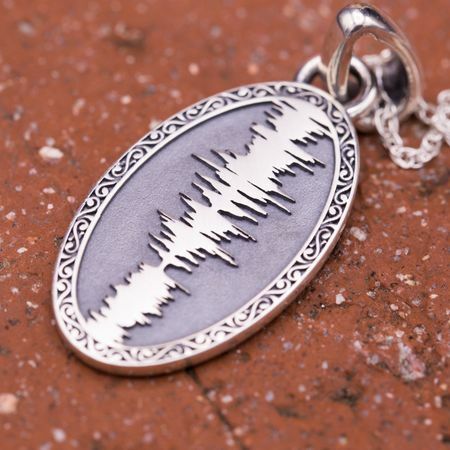 Nicholas' Pendant A thoughtful gift from a brother to a sister: we designed a pendant with a soundwave of American Pie, a song that's meant much to them both. 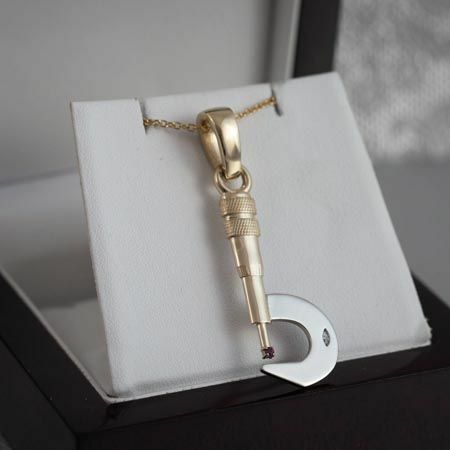 Steven's Pendant Transforming an old locking clip into a fine jewelry design, thie mixed yellow and white gold pendant delicately holds a ruby at the tip of the anvil. 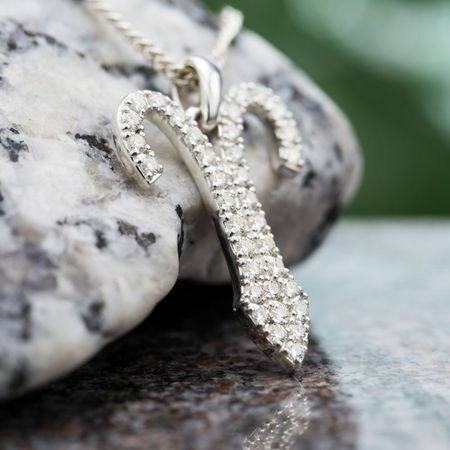 A small marquise cut diamond replaces the original logo. 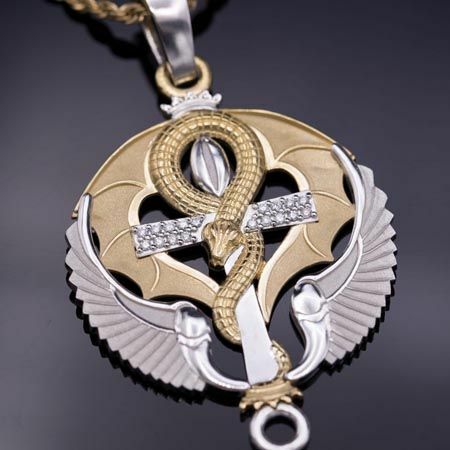 Dwight's Pendant So much personal detail in this wonderful design! To celebrate a 30th wedding anniversary, we worked with this husband to bring his vision to life. 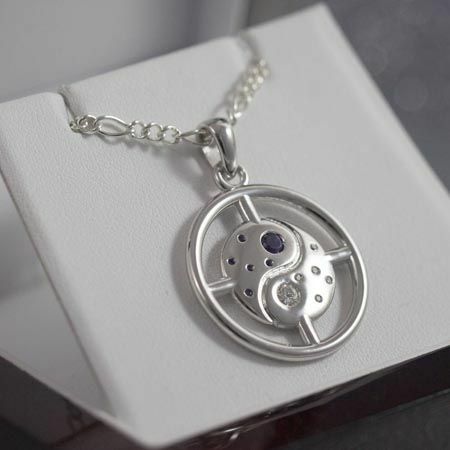 The pendant blends their birthstones (amethyst and diamond) in a yin and yang symbol, while the 4 spokes and outer circle represent ones and zeros for the binary value of '30' (11110). 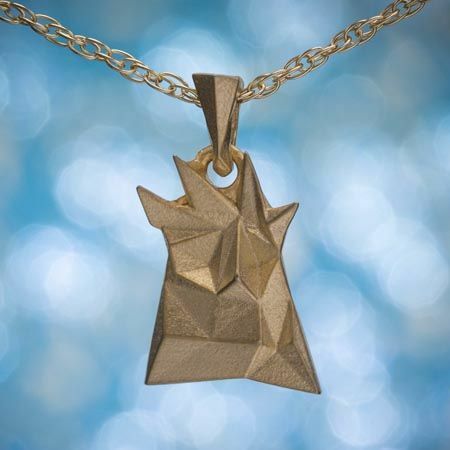 Jonathan's Pendant As an upgrade of a small, inexpensive necklace, we helped design this sparkly pendant covered with moissanite. 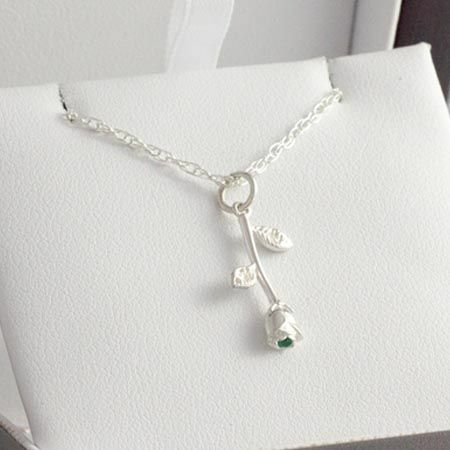 Nicholas' Pendant Inspired by the enchanted rose from Beauty & The Beast, this rose pendant features an emerald set within the petals of the rose to provide a beautiful green glow. 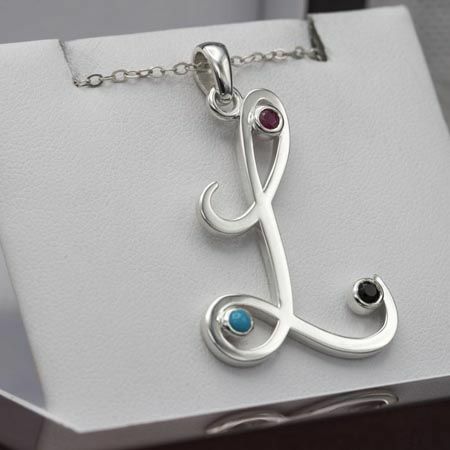 Scott's Pendant Starting from his wife's initial, we helped him design this pendant for with gems representing three options for the July birthstone: ruby, onyx, and turquoise. 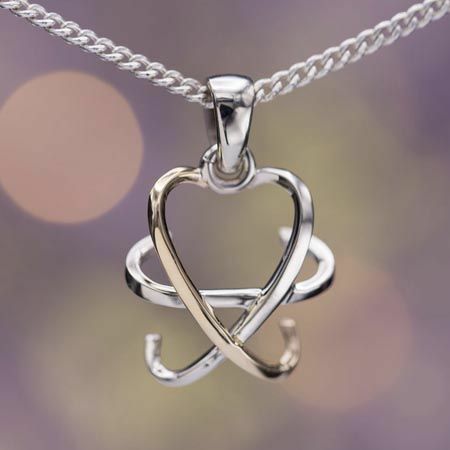 One each for him, for her, and for their unborn child. 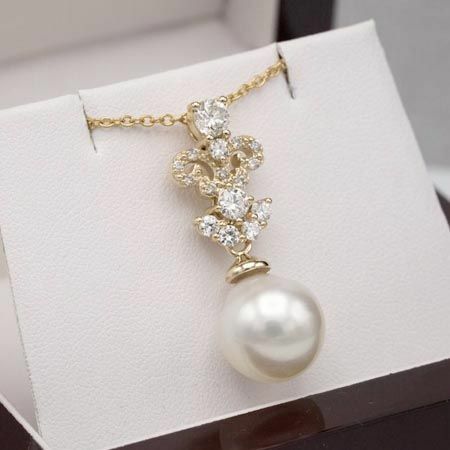 How much will my pendant cost? 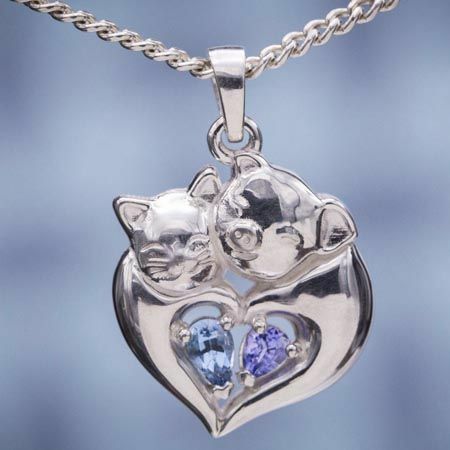 In general, our custom pendants are the same price as similar pendants off-the-shelf fine jewelry ('similar' meaning a comparable selection of metals and gemstones used, which are the biggest factors in price). Our aim is to make high-quality custom designs accessible to everyone. 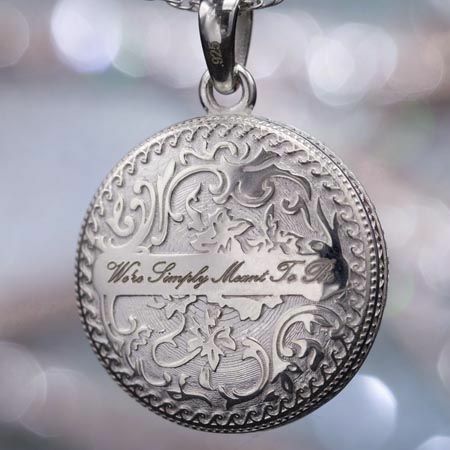 However, because our jewelry is extremely high quality, made from fine materials, and crafted to last a lifetime, we aren't able to offer pieces below $200 in most cases. 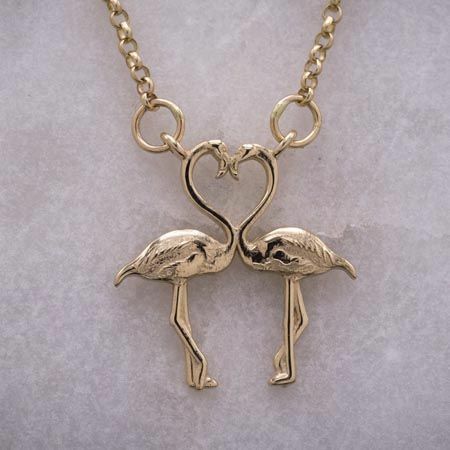 Each pendant we produce starts off as a brand new concept. Because of that, it’s difficult to know how much a piece is going to cost without knowing a bit more about the idea you have in mind. 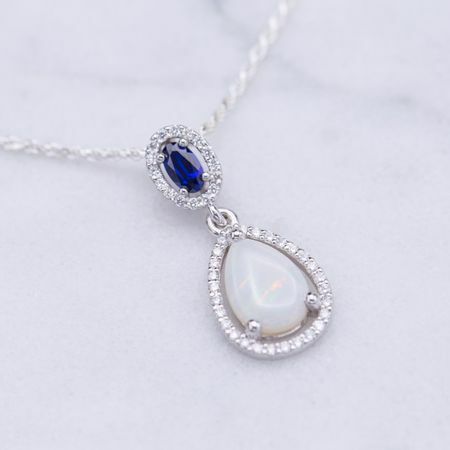 The easiest way to figure out how much your pendant will cost is to start a consultation with us and let our team know what you're looking for - we can provide an estimate with only a few details.